LYNCHBURG, Tenn. (WLS) -- 2-year-old Angler Davis might need a walker to get around, but that's not holding him back this Halloween. 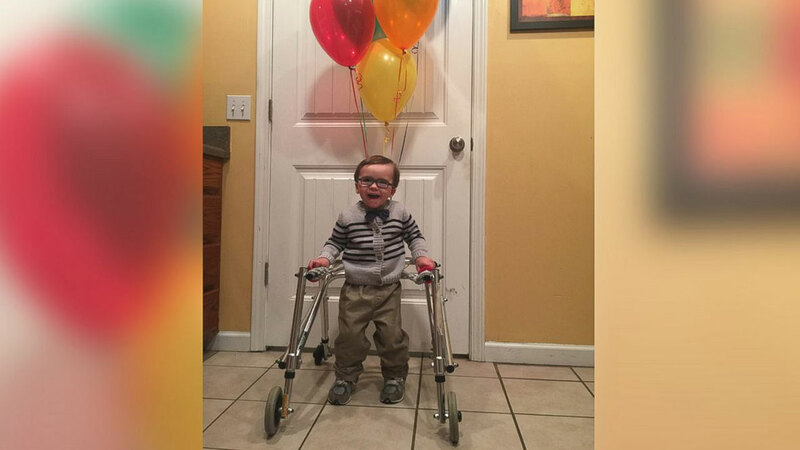 Angler's mom Ashley Davis, of Lynchburg, Tennessee, created this cute costume based on Carl Friedricksen from Disney's 2009 film "Up" to take advantage of the toddler's unique needs. Davis says that Angler has developmental delays and has difficulty walking, but that the family is working to make him feel like any other kid. "I think it just makes him happy to be like the other kids," Davis told ABC News. "Our big thing is to not let him feel like he is different. We treat him like a typical two-year-old." The family watched "Up" together a few months ago, but Davis isn't sure if Angler quite understands who he's pretending to be. "I think he realizes that's the guy from 'Up,' but he doesn't realize that's who he's dressed up as," Davis said. "I'll show him and he'll just grin." Davis says the costume was a cinch to make, since all she had to buy was the balloons. She's looking forward to being even more creative next year, after receiving positive feedback. "This morning, I was like, 'Oh my gosh, what are we going to do next year 'cause nothing is going to top this," she said, noting that in the future she would love to help come up with costume ideas for children with physical disabilities.